York Lo (with additional information by Peter Li): I searched the Chinese name of Chan Kim Ming and came up with one entry. 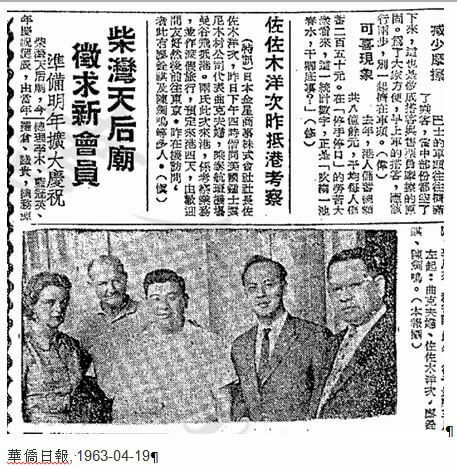 The article below from 1963 was published when a Japanese businessman by the name of Sasaki, the CEO of Japan Paper and Pulp, visited Hong Kong together with a Mr Cox, accompanied by his wife, from Bell & Winney (a US timber exporter) and were greeted by Chan Kim Ming (first from the right) and Nelson Leo (second from the right who was the manager of the Astor Hotel in TST) at the airport. Mr and Mrs Cox arrived in HK at 4pm on a Thai Airways flight from Bangkok. Their aim for this trip was business and sightseeing and they will stay for four days. They will then fly back to Tokyo. Could this be the same Chan Kim Ming as mentioned in a couple of articles linked below? This article was first posted on 4th September 2016.